Two ways to tell a poignant story of growing up in Cantonese. First written as a book, in My Grandfather’s Road, Neo Kim Seng explores his familial history through the lens and geography of a bygone Singapore, thinking of his childhood growing up on what is literally his grandfather’s road (Neo Pee Teck Lane) and told through personal memories and anecdotes. While we previously watched the full length English version of the monodrama (performed by Karen Tan), in the Cantonese versions of the show, Kim Seng presents two different ways of telling the same story as monodrama. 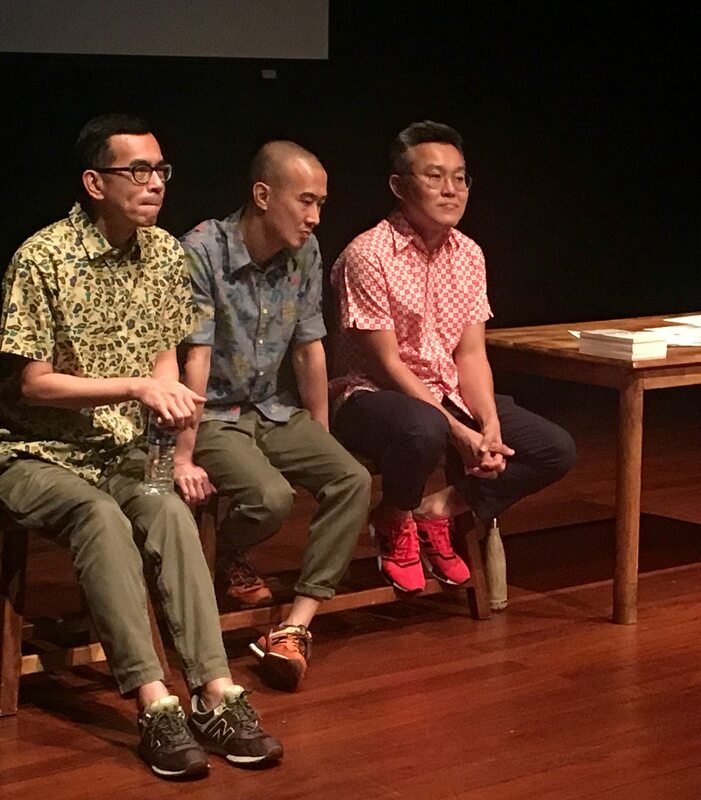 Adapted and performed by Tan Cher Kian and Gary Tang, each Cantonese adaptation runs for about half an hour, more selective about the information presented and changing the chronology of events. In both versions, Cher Kian and Gary attempt to embody Kim Seng visually, donning New Balance trainers and eyecatching patterned short-sleeved shirts. In Tan Cher Kian’s version, Cher Kian, similar to Karen Tan, takes on the role of Kim Seng himself, speaking from a first person perspective as he runs through a more streamlined selection of events and information about Kim Seng’s life. But unlike Karen, who embodied and performed the role with emotion, Cher Kian’s performance feels more detached from the material at hand, presenting them with little drama, and more as a reading and recount of the events in Kim Seng’s life. The speed at which the information is presented is smooth and with little focus on the external research done by Kim Seng, instead zooming in on the most personal of memories, such as the contrast between the grief felt for his best friend’s death in secondary school to the lack of tears shed at his brother and father’s funerals. Yet with its detachment, this form evokes the sense that we are watching an archival performance art piece, rather than a full on dramatic monologue, with many of the (older) audience members giving nods of approval as they themselves recognised the Singapore spoken of in the monologue. In Gary Tang’s version, instead of playing Kim Seng, Gary takes on the form of a storyteller, bringing us on a journey as he tells Kim Seng’s story as a family history from the third person point of view. This change in angle makes the work feel much more factual, charting the Neo family history in chronological order and keeping careful track of dates and locations. At the same time, Gary’s version is perhaps the most energetic and ‘entertaining’ one of the three, interspersing anecdotes with more physical depictions of scenes such as a castrated dog (and likening it to an incident in school where a doctor threatens to neuter a student). By taking on this role of an outsider looking in, Gary is able to play with the characters and present them very differently from the way Karen and Cher Kian have, the character’s personal distance from the story giving him the flexibility to go big without infringing on the story’s sense of sincerity – there is no need for big shows of emotion, only entertainment, as the storytelling form requires, leaving audiences with smiles on their faces as he acts out these anecdotes. In having watched all three versions, My Grandfather’s Road becomes an experiment in form, highlighting the varied ways in which the same story can be told, and showcasing how a change in perspective or actor transforms a history from anecdote to legacy. In each of these three versions, audiences found points of connection at different moments, different facts and memories more powerful depending on the way and context in which they are said. But across all three, My Grandfather’s Road is clear about the story it wants to tell – that while the past may fast disappear, it is one’s relationships with both family and one’s own memories that remain steadfast in the face of progress, and the power of nostalgia on full display when these stories are told and preserved, regardless of form. My Grandfather’s Road was performed in 2018 at the Centre 42 Black Box in English on 14th and 16th June (8pm) and 15th June (3pm), and in Cantonese with English surtitles on 15th June (8pm), 16th June (3pm) and 17th June (2.30pm). Visit their website for more information.